Rosa Alberic Barbier is a vigorous rambling rose with creamy white flowers with virtually evergreen glossy leaves making it ideal for covering walls and fences. The Banksian rose, named after the wife of Sir Joseph Banks, the famous director of RHS Kew Gardens. 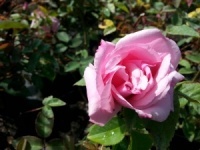 This lovely semi evergreen climbing rose which can achieve 7 metres or more under the right conditions has the prettiest small rosette like white flowers which come out from late spring and on into early summer with a most gorgeous delicate violet scent to them. 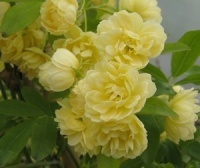 The Yellow Banksian Rose named after the wife of Sir Joseph Banks, this form produces masses of double yellow dainty flowers with an even more dainty scent. Large scented clusters of small creamy white flowers, a wonderful pom-pom display in mid-summer. Perfect for training over arches.